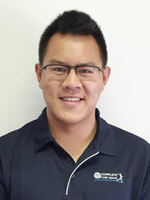 Chiropractor Henry Nguyen joined the Complete Care Team at the Ellenbrook and Wembley clinics, after completing his Doctor of Chiropractic at Murdoch University in 2015. Henry brings to Complete Care extensive experience as a Sports Trainer with nearly seven years’ experience working for various Football and Soccer clubs with his most recent team being the Forrest Field Rhinos Football Club. As a sports trainer Henry has a broad knowledge in the management and prevention of specific sporting injuries with vast experience in soft-tissue therapy, massage and sports taping. Henry also has a strong foundation in nutrition and is an advocate of making bone broth and fermenting Kefir Milk, Sauerkraut, Kim-Chi and Kombucha, which he believes is important for gut health. Just like our other practitioners at Complete Care, Henry promotes a holistic approach involving Chiropractic care, nutrition and positive lifestyle changes which can help people improve their health, increase their overall function and quality of life! Henry uses gentle, hand-on chiropractic techniques for his patients including Diversified, Drop Piece, Activator and the Sacro-Occipital Technique (SOT), muscle work as well as providing exercise and nutritional advice to help his patients achieve their goals. In his spare time Henry loves cycling, cooking and spending time with his wife Joan and two boys, Isaac and Isaiah.